Published in an Online First this week by JAMIA was the extension of the original DiaTel study published in Diabetes Care in 2010. The original study ran from 2005-2007, and patients were randomized to an “Active Care Management” (ACM) arm or a “Care Coordination” (CC) arm. The ACM arm transmitted blood glucose values daily, with a nurse practitioner adjusting their medications every 24-72 hours following ADA guidelines. The CC group received a monthly care coordination phone call offering diabetes self-management education and a referral to their primary care provider for medication adjustment. At 3 months, A1c reductions in the ACM group were 1.7% versus 0.7% in the CC group and at 6 months this was sustained at 1.7% versus 0.8% (p<0.001 for each of these). Methods: The population studied was a VA (Veterans Affairs) population in Pittsburgh. It is notable that this population does not reflect the typical US civilian population, as they were nearly 100% male, over 80% caucasian, <20% college-educated, and more than half were retired. The primary outcome measure was HbA1c. The mean A1c (at original DiaTel randomization) for the two groups was around 9.5%. As you can see in the above diagram, some patients in the initial ACM group who had been transmitting glucoses daily were “stepped-down” in intensity to a “CCHT” intervention, where they continued to transmit glucose values daily but no longer had active medication management by the nurse practitioner. Other ACM patients were “stepped-down” to the CC intervention. Notably, no ACM patients were kept on ACM, and no ACM patients were sent all the way back to “UC” or usual care. From the initial CC group (this is the group who got monthly phone calls), participants were randomized to continued CC, or “stepped-down” to usual care, UC. Usual care consisted of primary care visits every 3-6 months. The results of the study? They did not show a benefit in continuation of the higher-intensity intervention, eg continued home telemonitoring. The authors write that this suggests that a lower intensity of contact can be used after the initial period to maintain the same level of improvement in glycemic control. Some of the results are shown below, from Figure 3 in the paper, and please note that the initial DiaTel study is indicated by months 0-6 below, with the extension period being months 6-12. Though a very interesting, necessary, and useful study, as with most studies, there are some limitations to it, many of which are pointed out by the authors. The population studied was a typical VA population, but this does not reflect the typical civilian US population. Because the extension trial could only be done in original study participants, the statistical power of the study was limited. This means that even if there was a true difference between groups, the study might not have been “powerful” enough to show it. 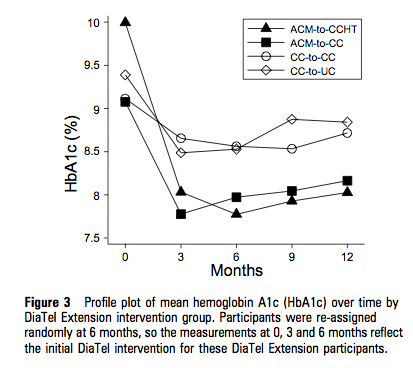 Interestingly, looking at the graphic in Figure 3 above, you can start to visually see a worsening in A1c in the ACM to CCHT arm of the trial, however, there was no statistical significance seen (was the lack of significance only because of insufficient power?). The authors chose not to create an ACM to ACM group or an ACM to usual care group for the extension of the trial, so we don’t know how those would have stacked up. We do not know what the duration of A1c lowering from an intensive telemedicine intervention would be, and we also don’t know how long the initial intensive management period needs to be in order to achieve an improvement. The authors point out that to generalize and disseminate a telemedicine intervention like this one will require a reimbursement mechanism and consideration of cost-effective ways of deploying it. 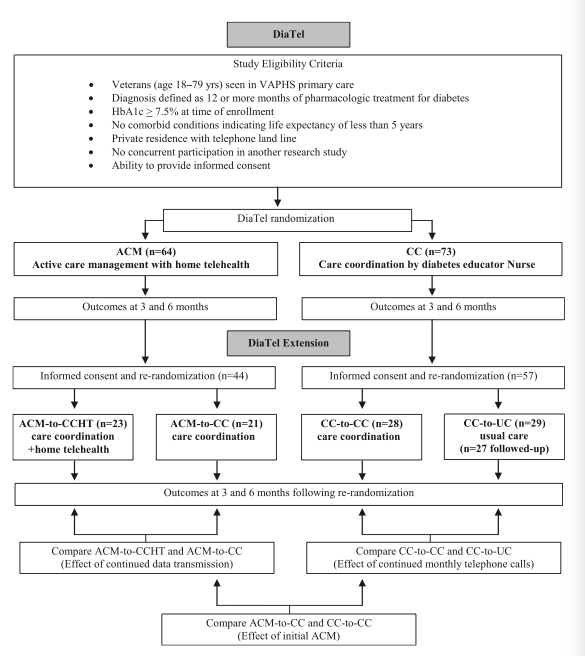 The bottom line is that a six-month long, intensive telemedicine intervention for diabetes management appears to improve A1c in this VA population, and that A1c improvement might be sustained even when the intensity of management is reduced.